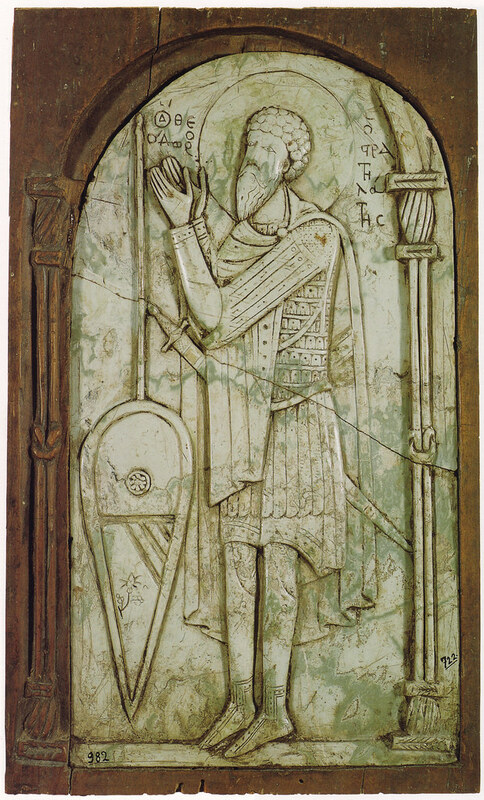 An 11th century carved ikon of St Theodore with sword, shield and spear, and wearing "offset" banded lamellar. His sleeve armour seems similar to the Vatopedi St George, but his kremasmata resemble those of Joshua from Hosias Loukas. This ikon was part of the spoils of the Fourth Crusade, and its new Latin "owner" has carved his own blazon on the shield. Museo Sacro della Biblioteca Apostolica, Vatican. Note the leggings extend up at the front, perhaps as a strap that attaches to a waist belt. The chlamys, or cloak, is adorned with a tablion, a rectangular embroidered panel indicating the wearer’s rank.